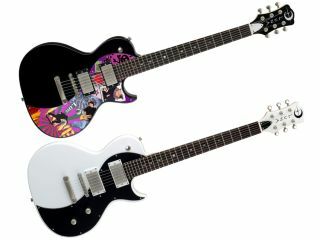 Luna Guitars has expanded its Neo series of solid-bodied electrics with the customisable Your Space guitar. Luna hopes to encourage players to “express their own uniqueness”. The Your Space guitar has a clear, unscrewable pick guard allowing the owner to place photos, song lyrics, poetry or any other flat piece of artwork as decoration. The pick guard is then screwed back on to keep it all in place. Other features of the Neo series include matte nickel humbucking pickups and hardware, an LP-positioned selector switch, brushed nickel tuners and a rosewood fingerboard with Luna´s signature mother-of-pearl moon phase fret markers. Available colours are red or pink with white pick guards and white with a black pick guard. The Neo Your Space guitar has a list price of $450. Visit Luna Guitars for more information.